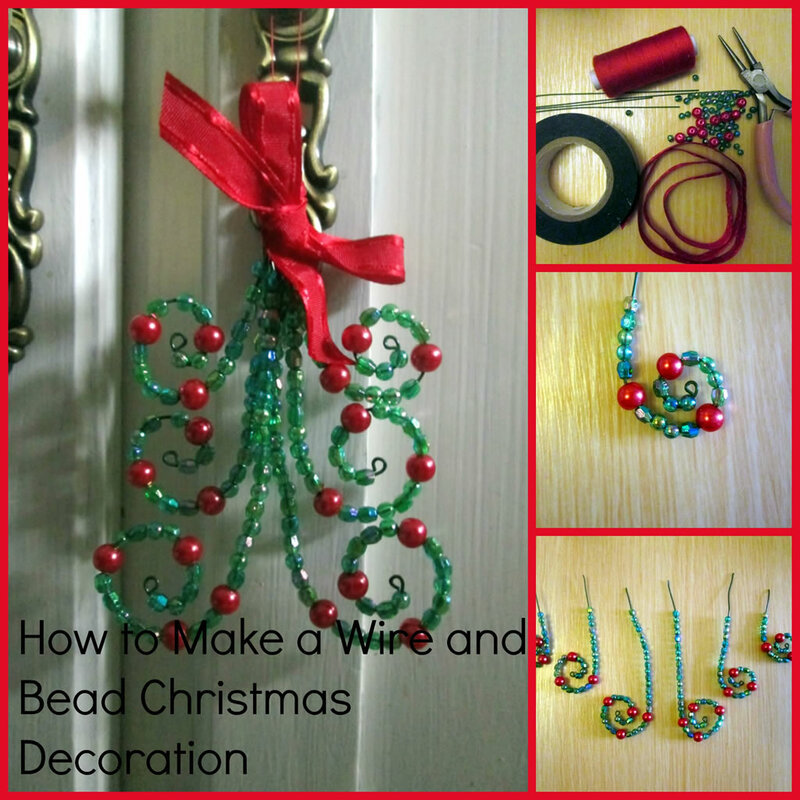 Following on from my last post on how to make wire and bead Christmas decorations (which you can read here), here is another tutorial for making a wire and bead decoration. 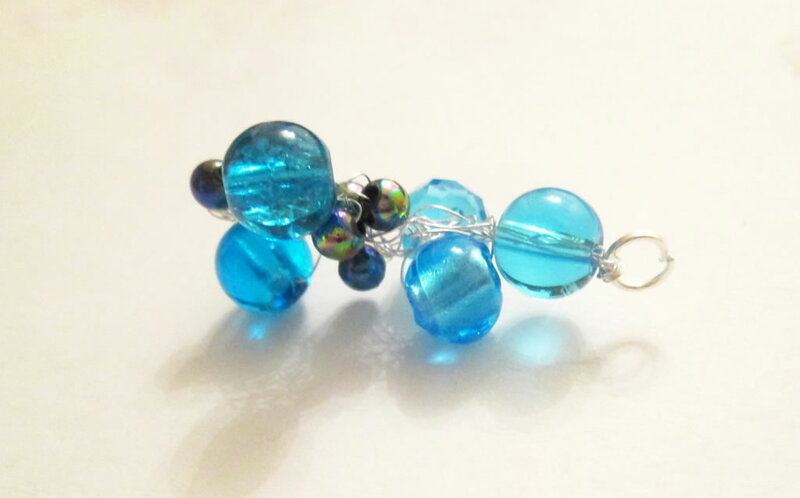 It requires the same materials and the same kind of techniques, it’s just a bit more fiddly! 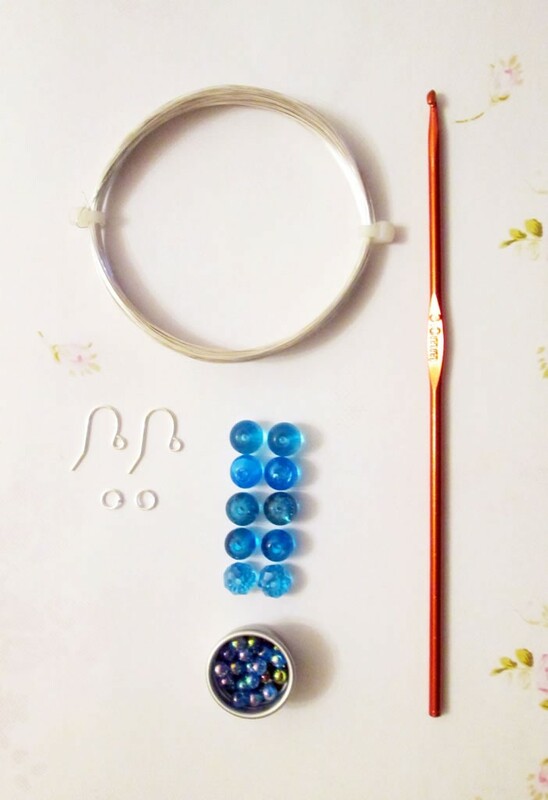 You will need: beads (I used small round green beads, small faceted beads and slightly larger red beads), florists’ wire, tape, ribbon, needle and thread, round nosed pliers (optional). 1. 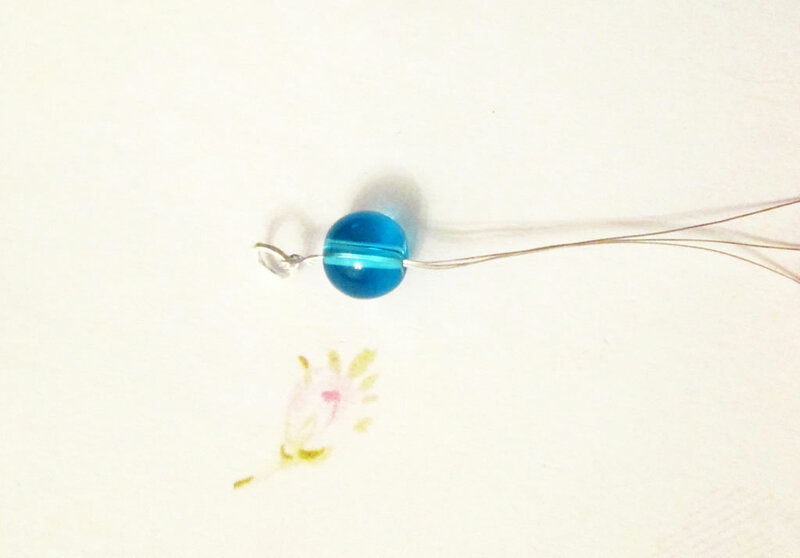 From the florists’ wire, cut 2 pieces measuring 11 cm, 2 pieces measuring 15 cm and 2 pieces measuring 18.5 cm. 2. 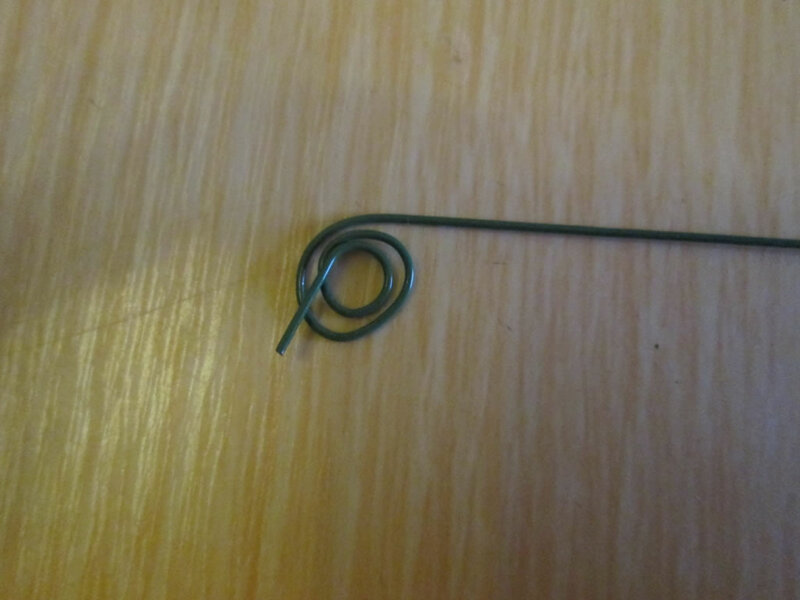 Take one of the pieces of wire and bend the end into a loop. 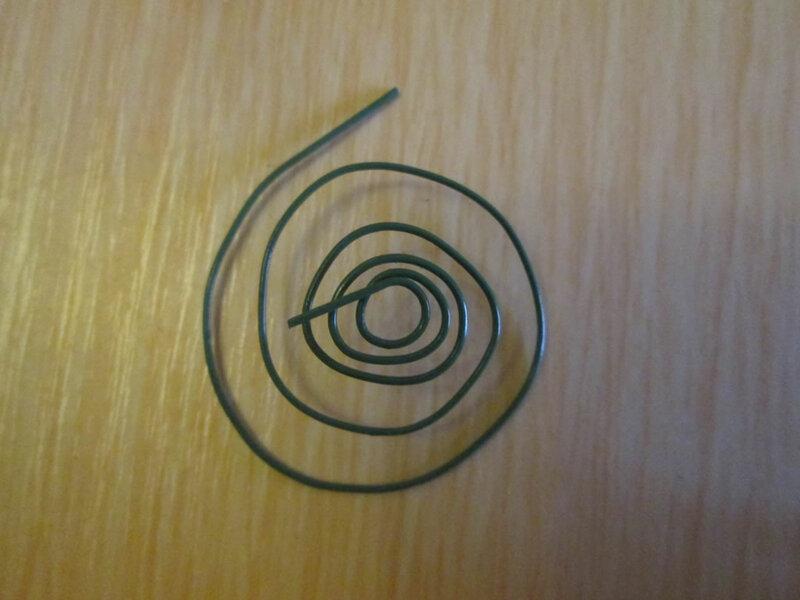 Continue to bend the rest of the wire round into a short, open spiral. 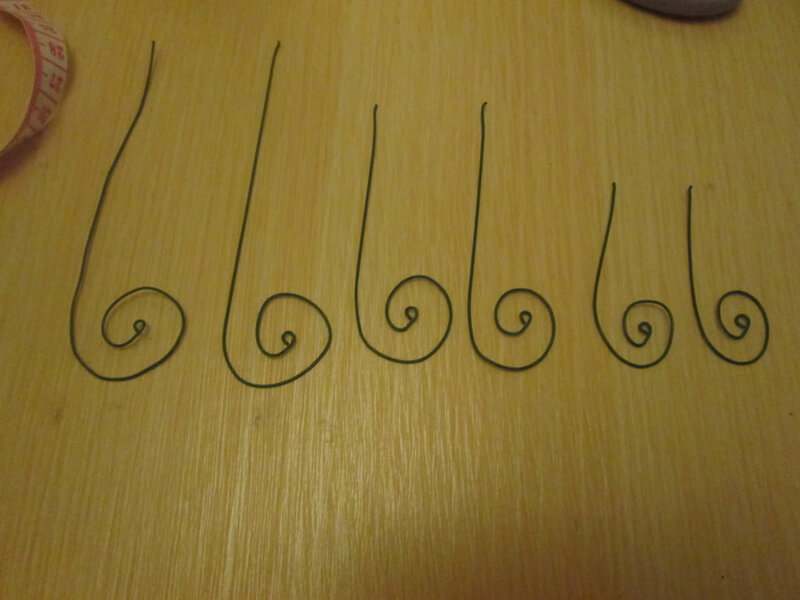 Repeat for the other pieces of wire. 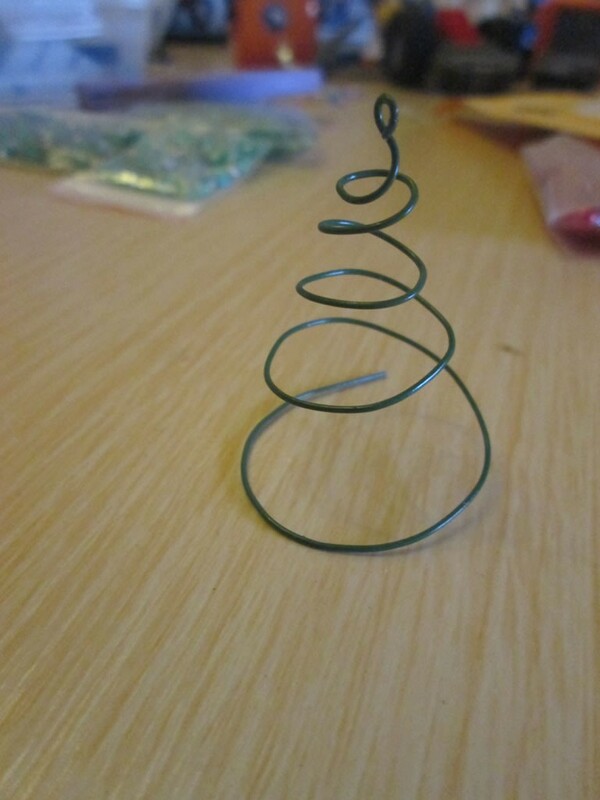 The overall effect of the finished ornament will be better if the spirals on the shorter pieces of wire a tighter than on the longer pieces. 4. 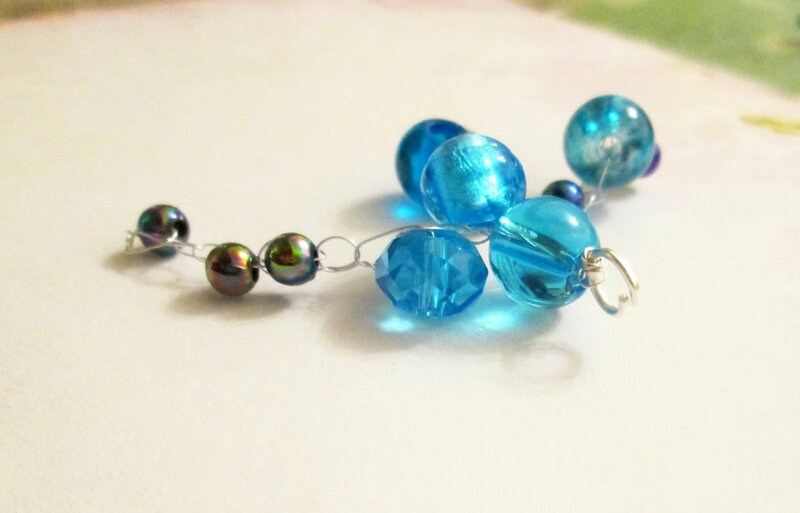 Start threading the beads onto the wire. 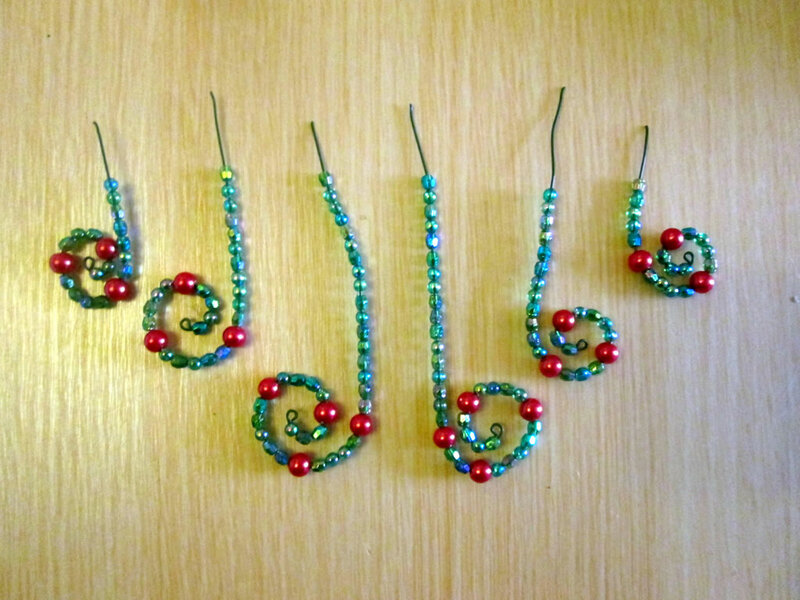 I used a mixture of round and faceted beads with some larger red ones to give the impression of baubles. 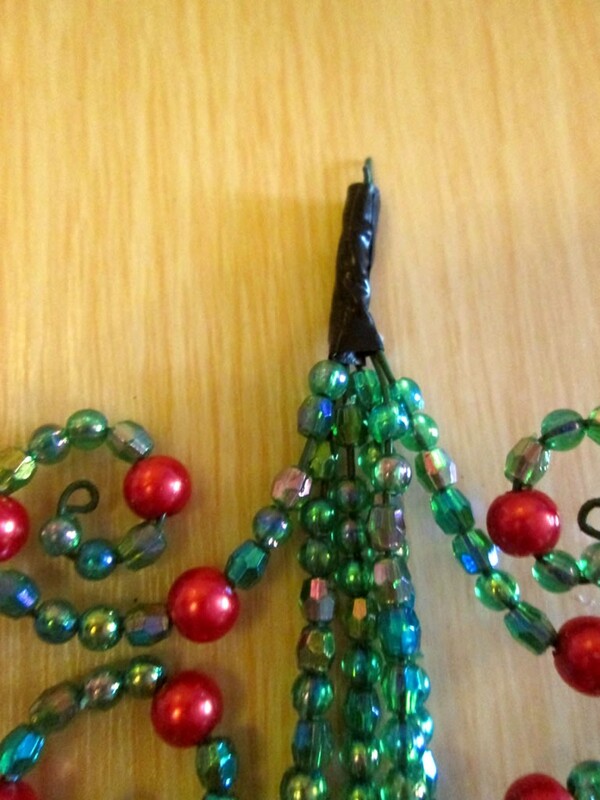 Leave a couple of cm of wire at the top to allow for joining the pieces together. 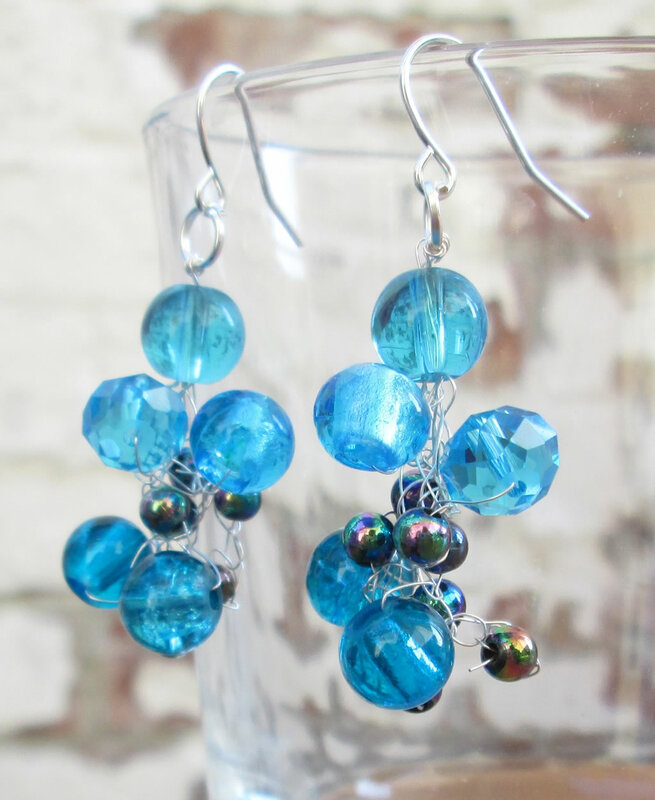 Keep going until you have threaded beads onto all the pieces of wire. 5. This is the fiddly part! You might want to move your decoration bits onto a tray at this point. 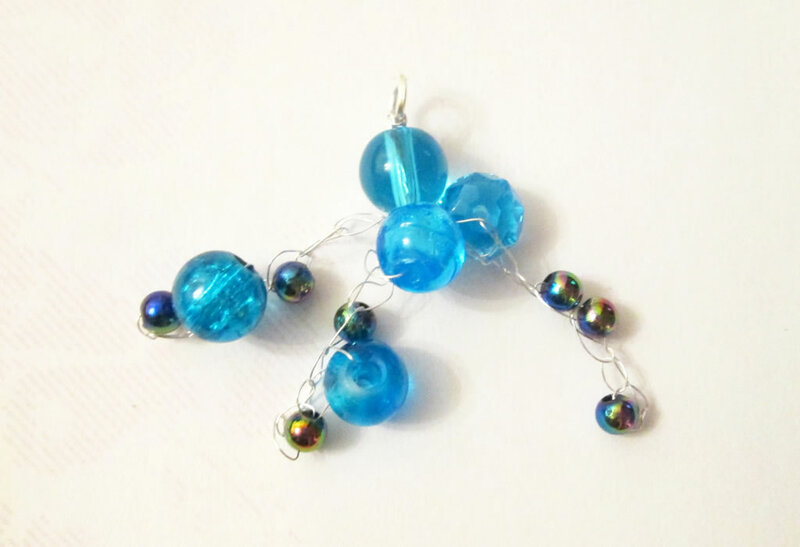 I did not and as a result ended up grovelling around under the table picking beads up off the floor when I dropped them! Cut a piece of tape and lay it on the table sticky side up. 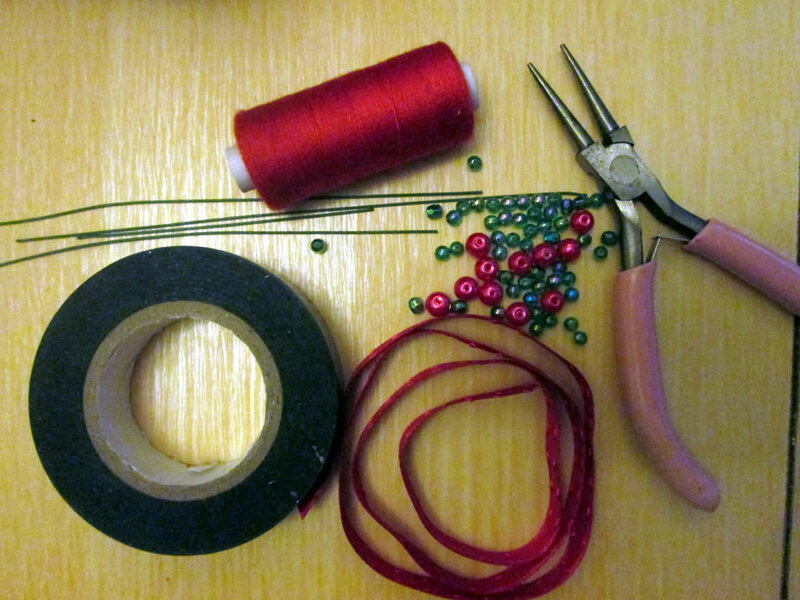 Place the pieces of wire onto the tape so that the unbeaded ends are on the tape and close together. Wrap the tape around the ends to hold them. 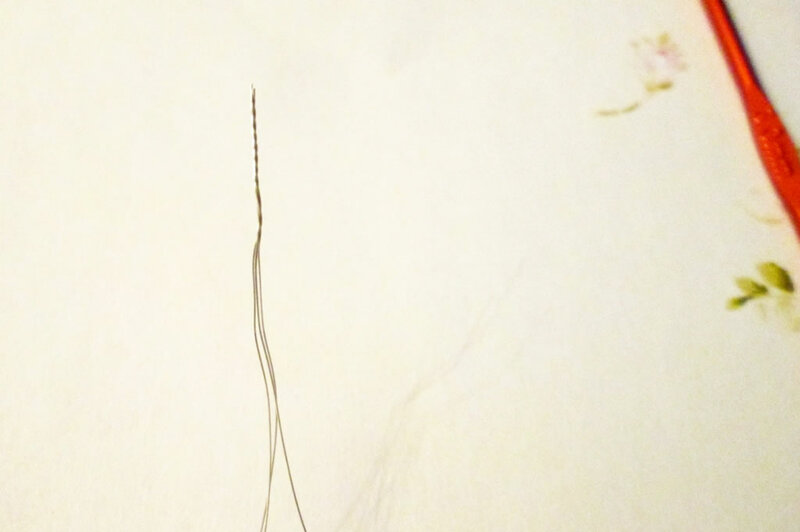 Bend or trim any wire protruding from the top. 6. Wrap some ribbon round the top to hide the tape. Tie in a bow. 7. 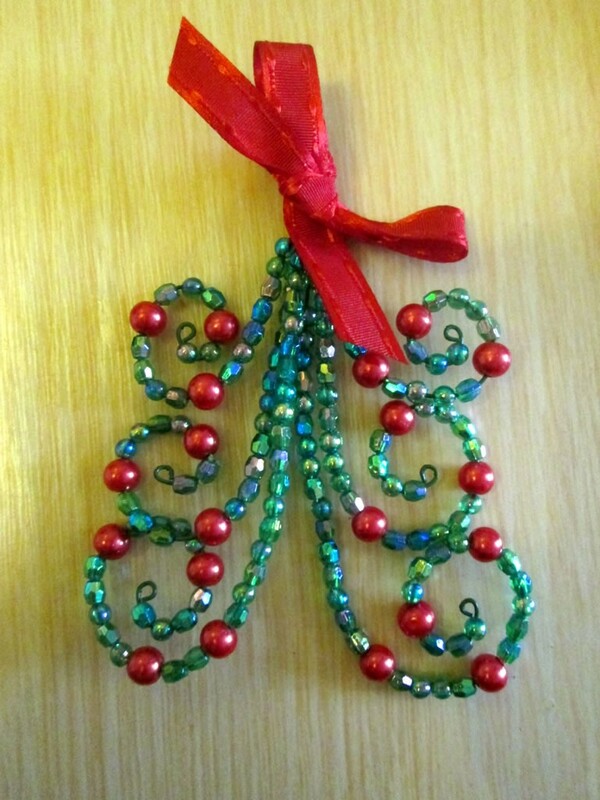 Sew a few stitches into the ribbon at the back of the decoration, leaving a tail several cm. 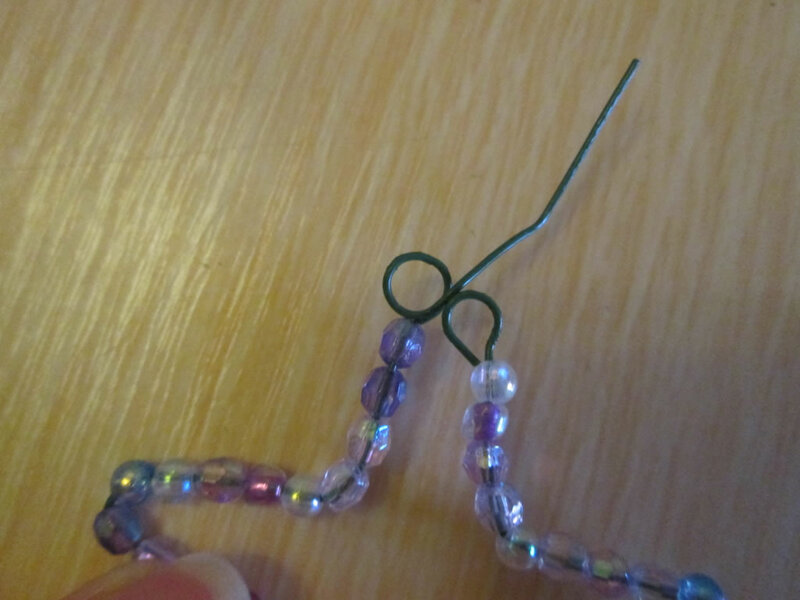 Tie the ends together to make a loop. 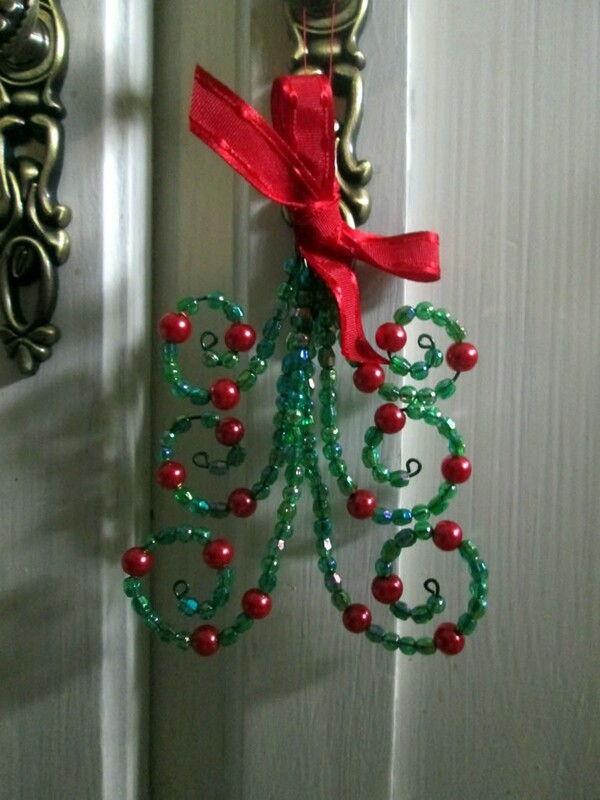 You might need to adjust your decoration by bending the branches of tree. 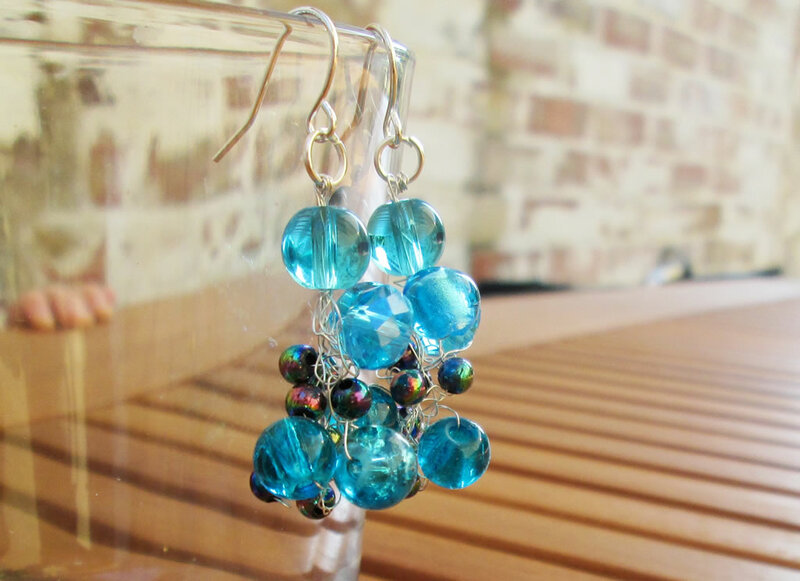 It might make a nice gift for somebody. What do you think? 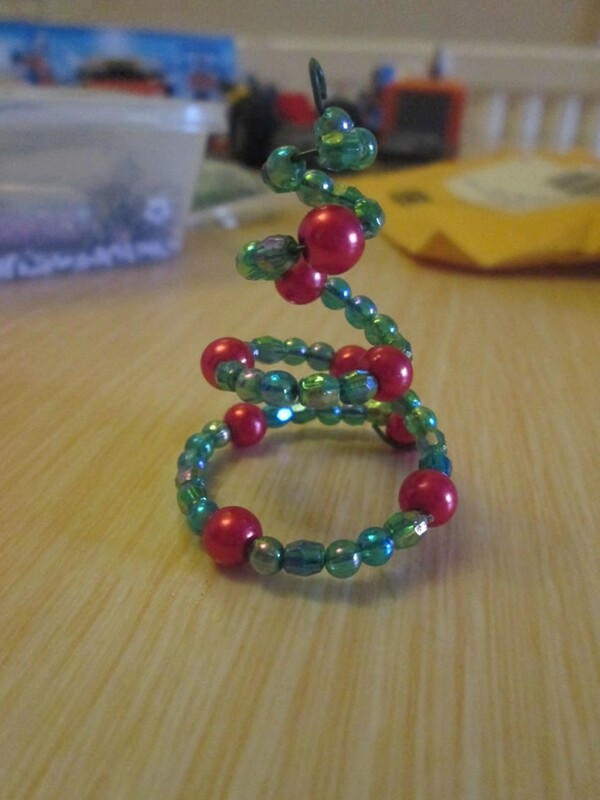 It’s good to have some sparkle on your Christmas tree, right? 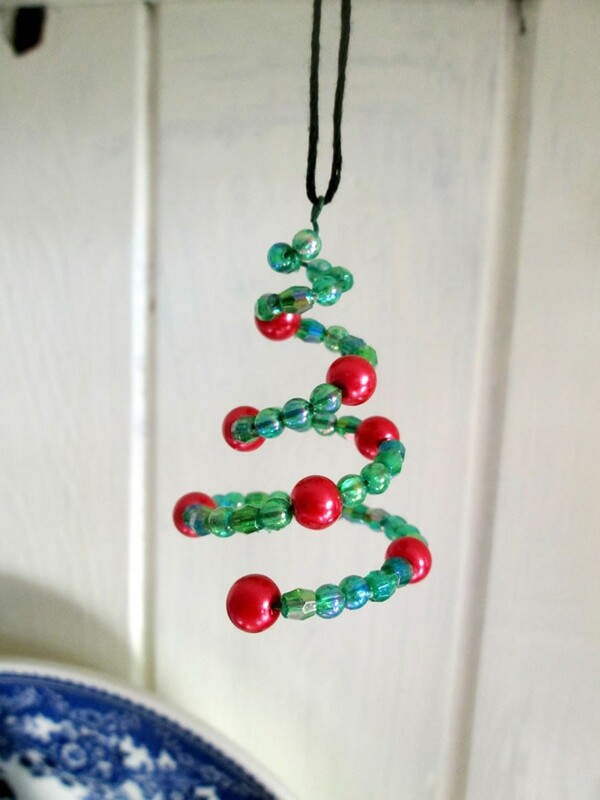 Non sparkly tree decorations are fine, but we also need some twinkly ones! 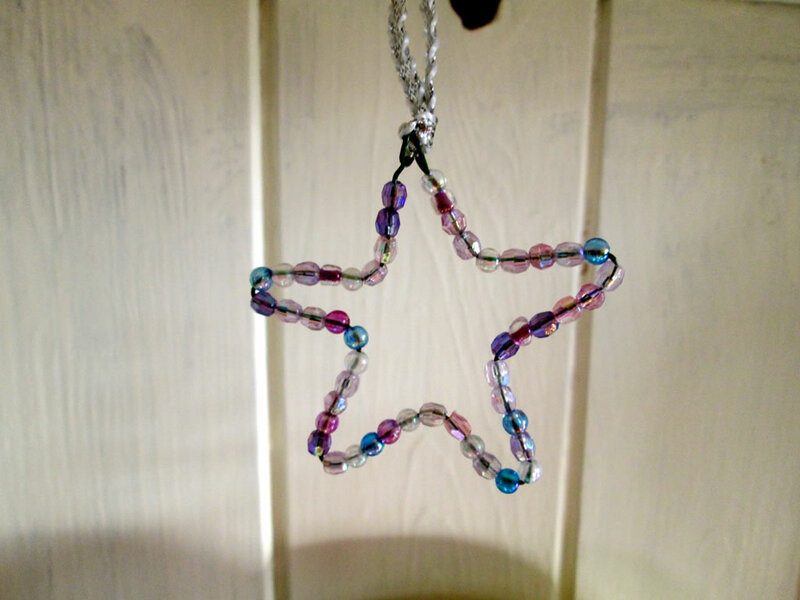 Here is 2 tutorials for making your own sparkly, twinkly Christmas decorations. 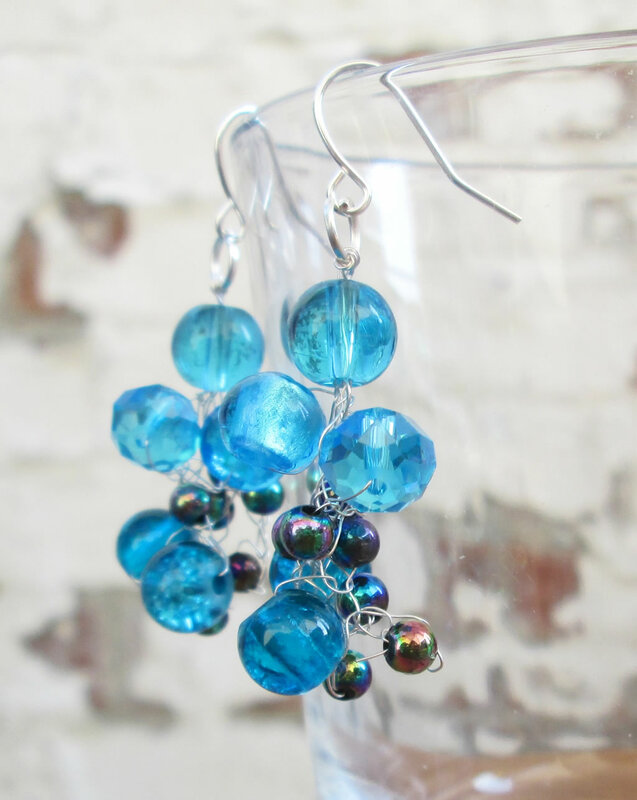 They are very easy to make so get the kids on board too! They are both made in the same way. 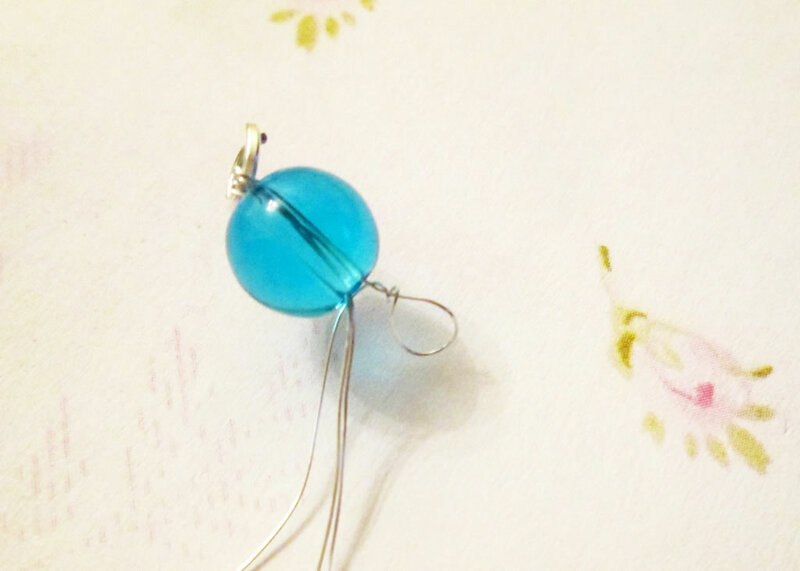 Just bend the wire into the shape you want (cookie cutters ahoy! 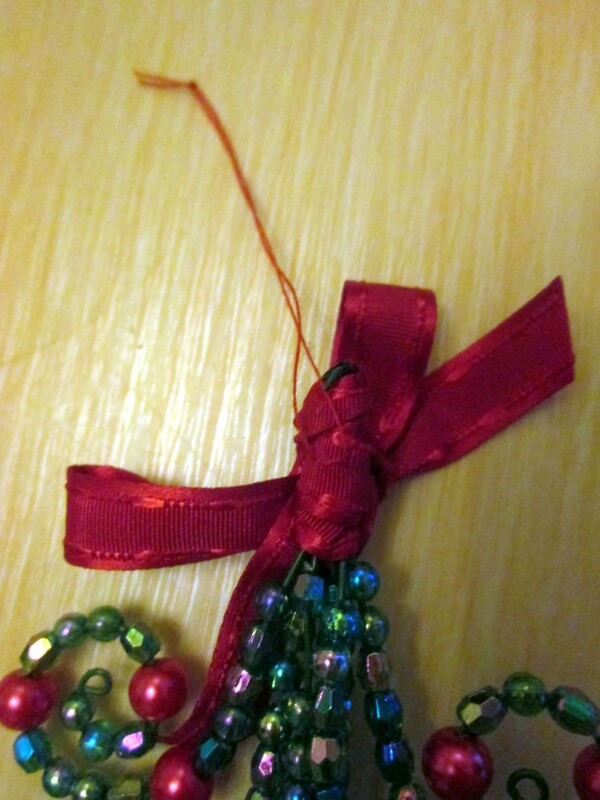 ), thread the beads on and add a loop of ribbon. 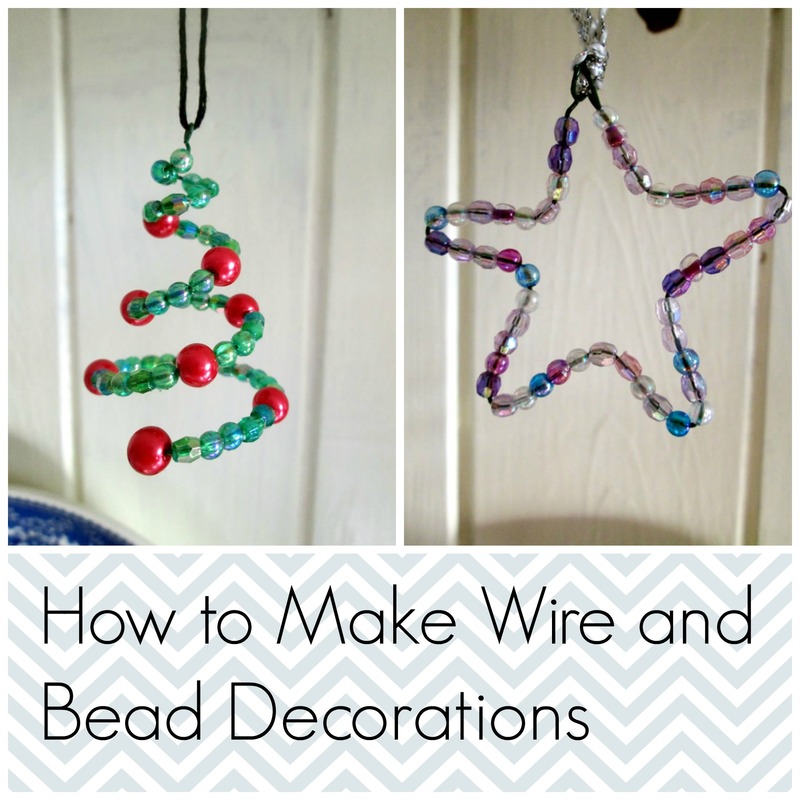 You will need: wire (I used florists’ wire), beads, ribbon or strong thread, star shaped cookie cutter (optional), round nosed pliers (optional). 1. 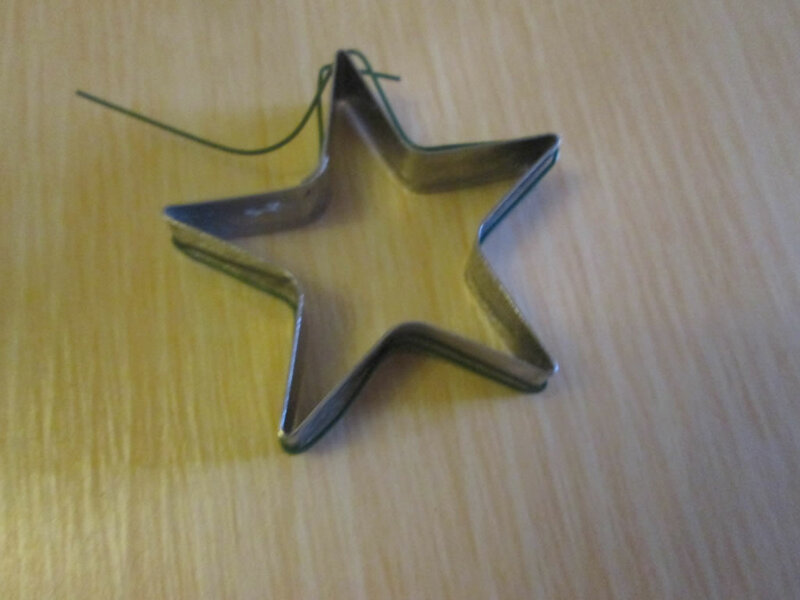 Bend a piece of wire around a star shaped cookie cutter. 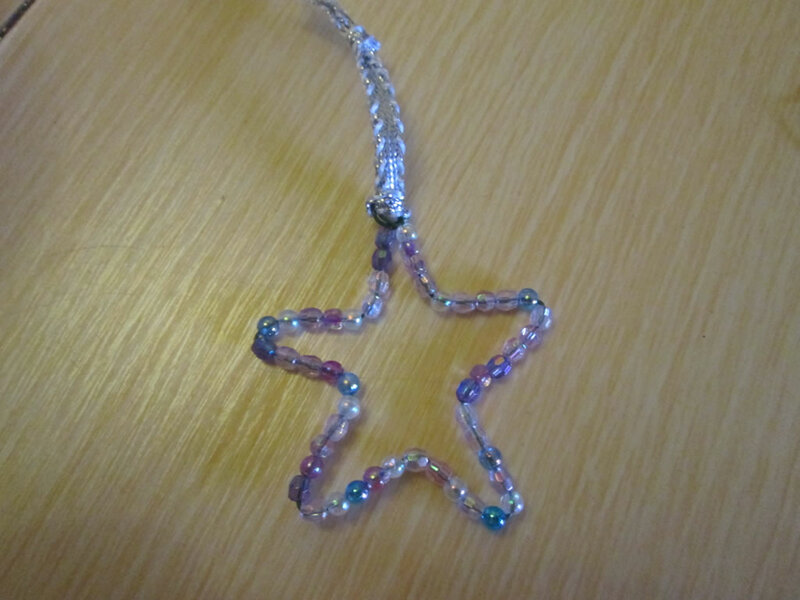 If you do not have one, you could either just bend it into a star, or you could draw a star shape and use that as a template. 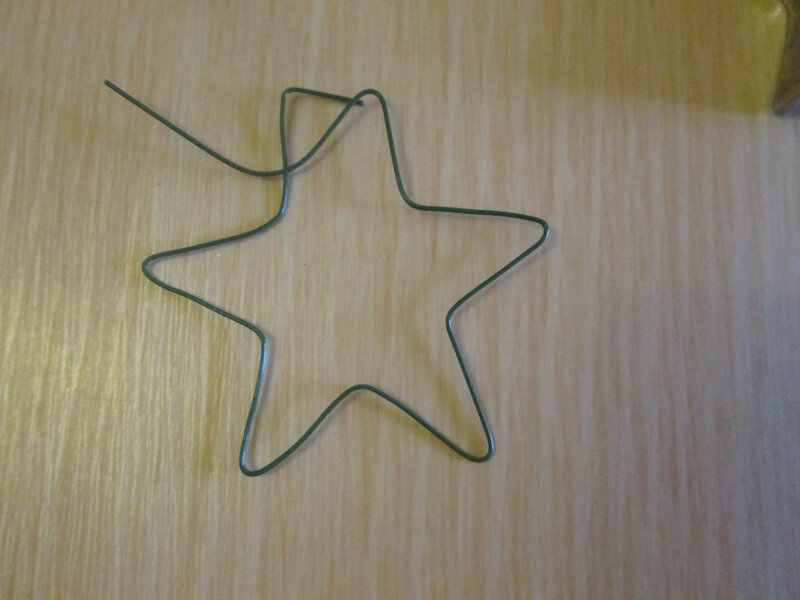 Leave some wire spare for making loops at the top of the star. 2. 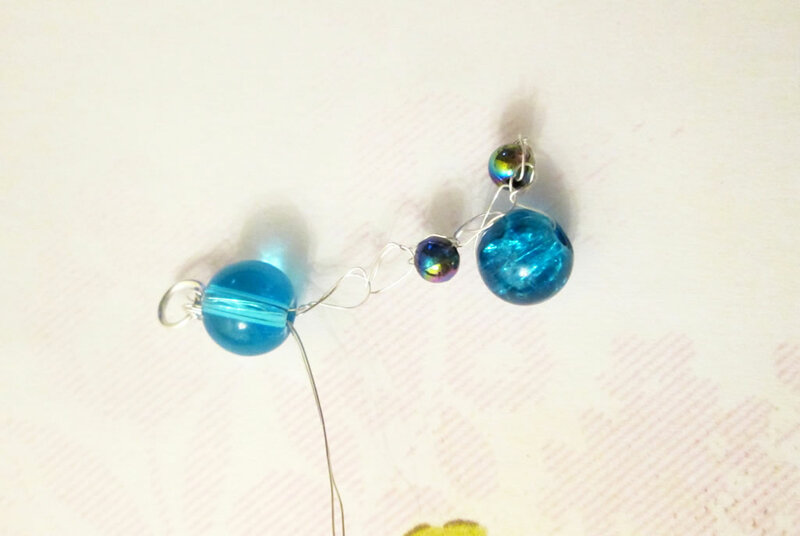 Thread beads onto the wire. 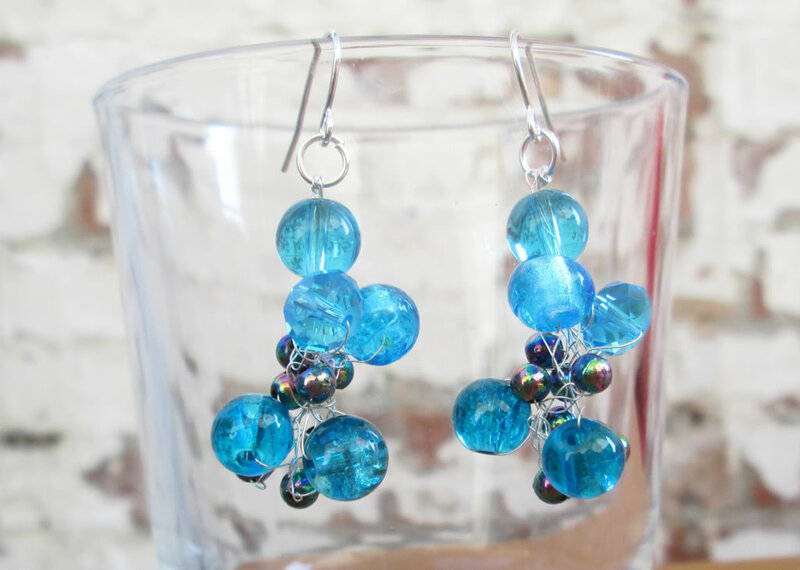 I used a variety of larger seed beads and small faceted beads. 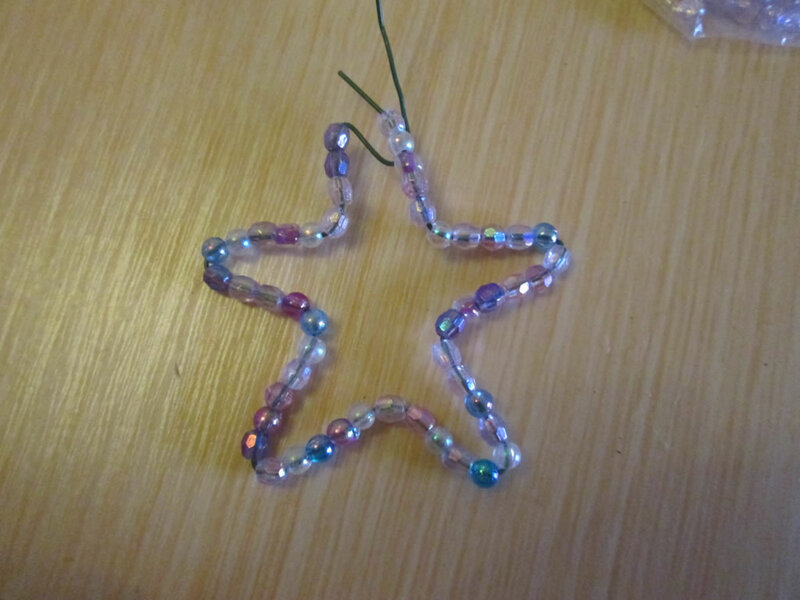 You might need to unbend your star a little bit to get the beads round the corners. 3. When you have covered the star, make a loop at either end. If you have round nosed pliers, you could use those. Otherwise you could bend the ends round a pencil. 4. Thread a piece of ribbon through the loops and tie the ends together. 1. 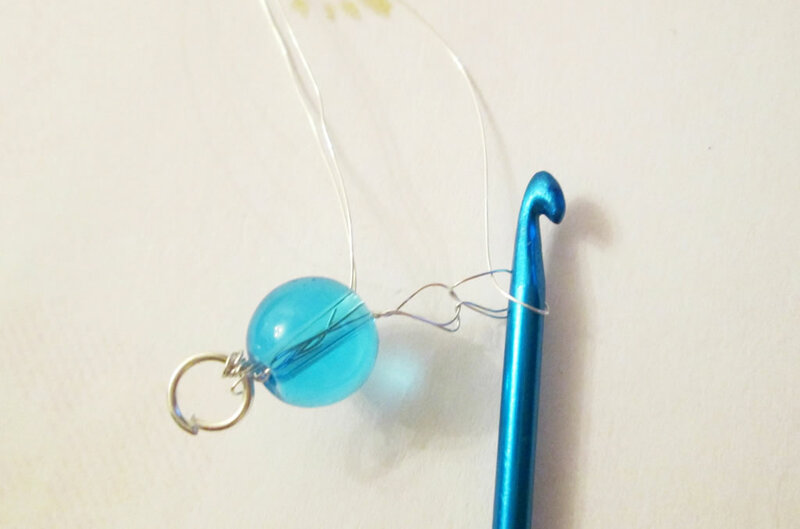 Starting at one end of the length of wire, bend it into a loop. Leave a little bit of wire at the end. 2. 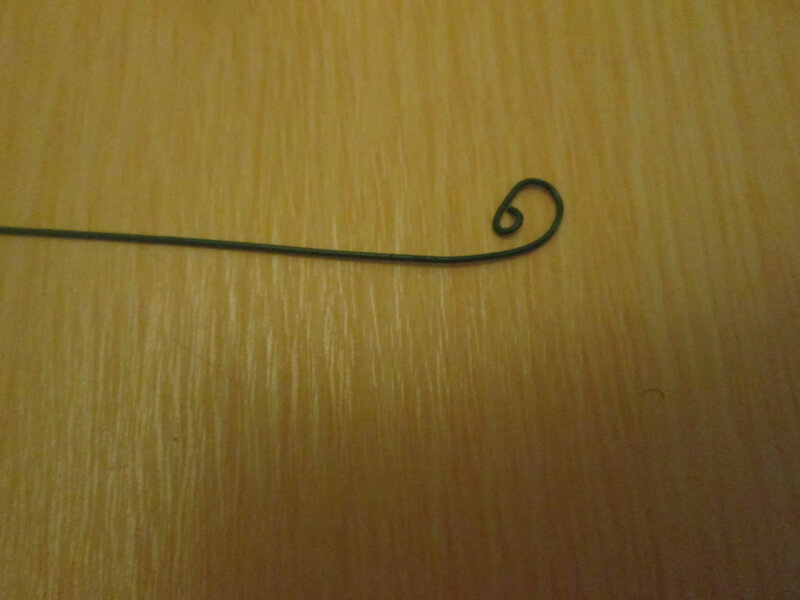 Keep bending the wire round so that it makes a flat spiral. 3. Take the end in the middle of the spiral. 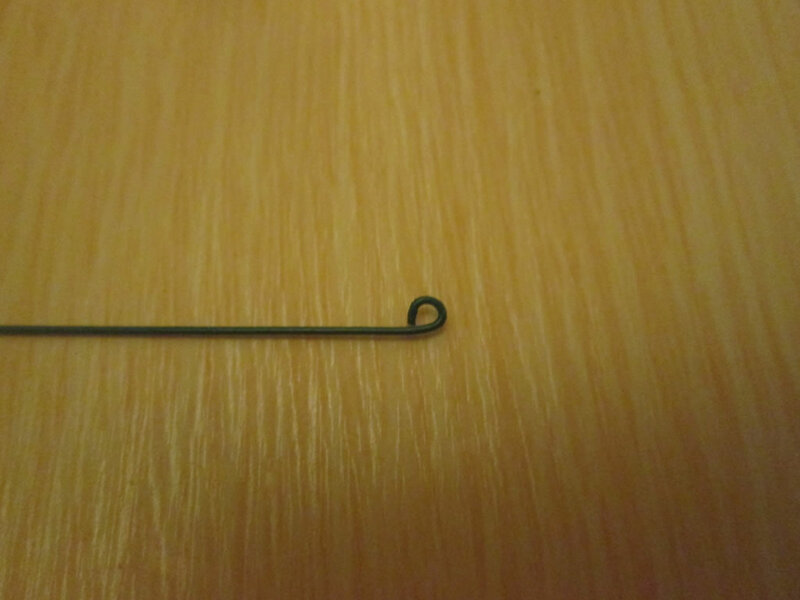 Using round nosed pliers, make a small loop. 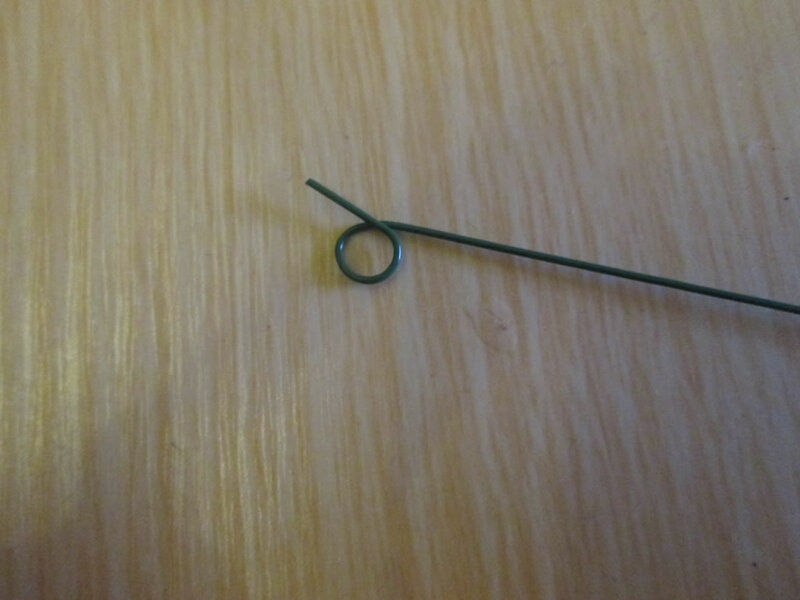 If you do not have round nosed pliers, bend the wire round a skewer or a cocktail stick. Stretch the spiral. 4. 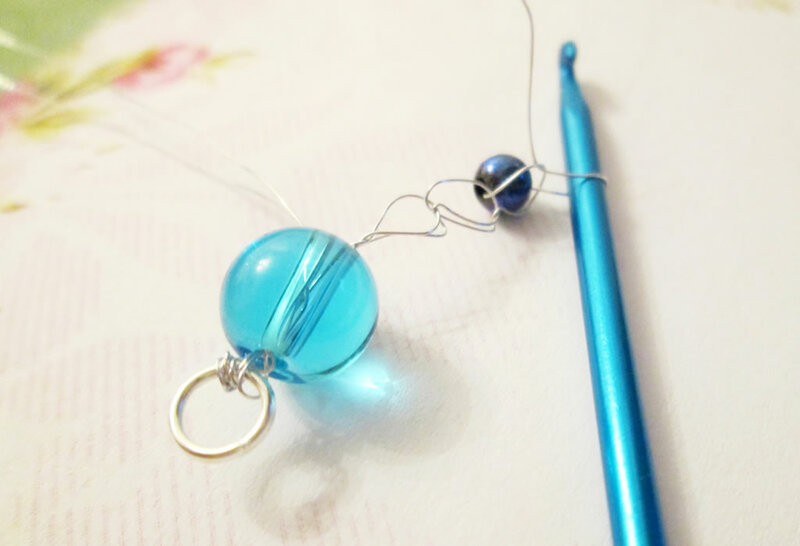 Starting at the bottom, thread beads onto the wire. 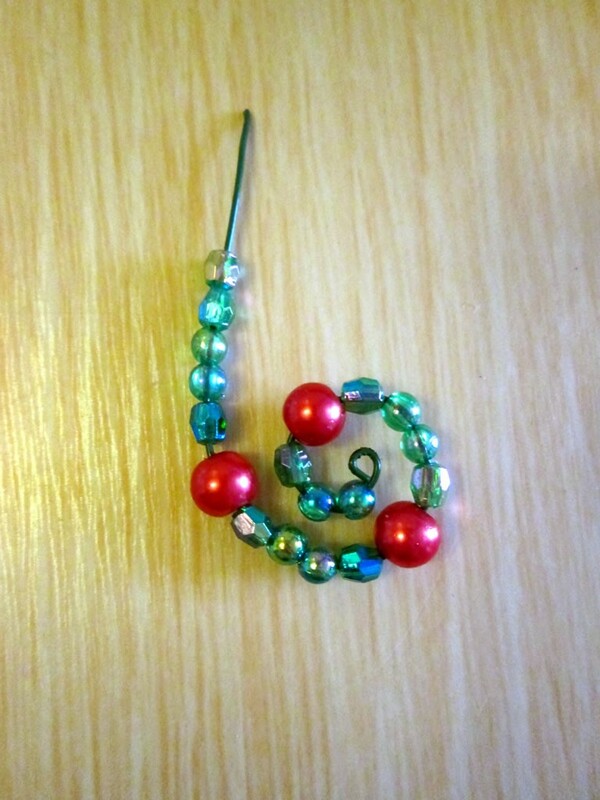 I used a mixture of small round and faceted green beads and some larger red beads. 5. 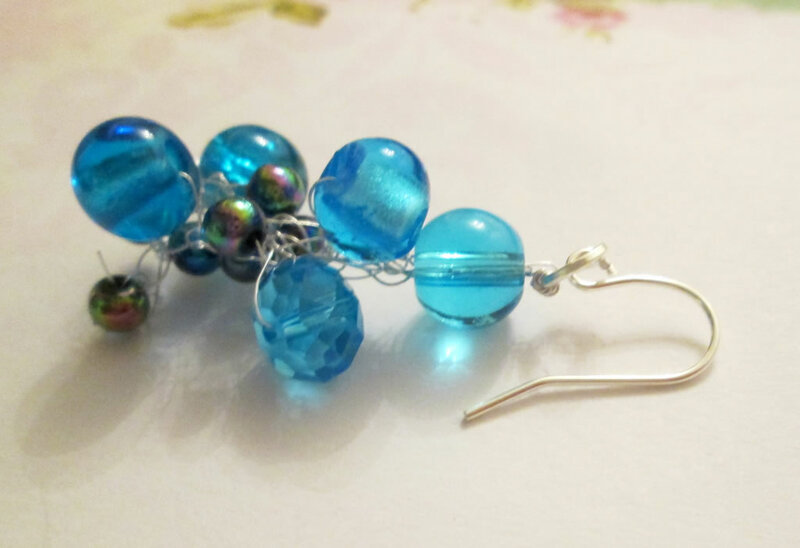 When threading on the beads, leave a little bit spare to bend around the last bead to hold.